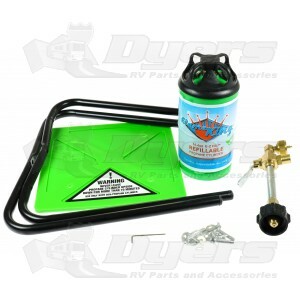 The Flame King(YSN Imports) 1 lb refillable propane cylinder is compatible with all appliances that today's disposable propane cylinders are compatible with. SAVE MONEY Refill costs are much less expense than disposable propane tanks. LITTLE KNOWN 'DIRTY SECRET': The 1 lb disposable cylinders left behind at parks or shipped to HHW waste sites, still need to be disposed of. Those parks and municipalities pay around $2.00/pc for specialized companies to come and get rid of them. That means not only did you spend all that money to buy a disposable item on the front end, but your tax dollars are being spent to dispose of them on the back end as well! There has to be a better way, and we at Flame King are bringing that solution to you! Easy And Safe To Use And Refill. Reduce Waste, Your Refillable 1 Pound Propane Tanks Will Reduce The HAZMAT Problem And Not End Up In Landfills. Save Money, Refill Costs Are Much Less Expense Than Disposable Propane Tanks. Cylinder is of high grade steel construction with ETL approved valve. Certified by the DOT as legally and lawfully refillable and transportable. Cylinder is x-ray and hydrostatic tested and powder coat painted for long lasting exterior protection.